This small viper ranges from Spain to the Arctic Circle (in Finland) and east through the Balkans and the Carpathians to the Caucasus. It used to be common in England and, according to legend, is one of the snakes that St. Patrick drove out of Ireland. While local populations vary in color pattern, the central European form shows a silvery-grey back marked by a wide, blackish-brown line in a zigzag pattern. These small (2-foot-long), live-bearing snakes are vipers, characterized by having their fangs located on a movable bone. The fangs, which are folded back against the roof of the mouth when the jaws are closed, can be erected for stabbing into prey when the mouth is open. 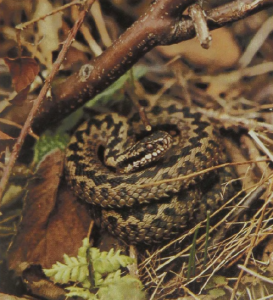 Some half-dozen other species, partly overlapping the range of this viper, belong in the same genus, which also includes Russell’s Viper.